Mission decal for the Soyuz TMA-04M flight. Soyuz TMA-04M is a spaceflight, currently in Low Earth orbit, that transported three members of the Expedition 31 crew to the International Space Station (ISS), which launched on May 15, 2012. 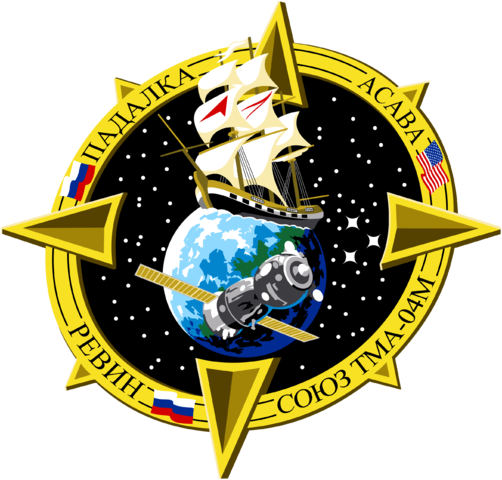 TMA-04M is the Soyuz spacecraft's 113th flight since its initial launch in 1967, and the fourth launch of the improved Soyuz TMA-M series (first launched October 7, 2010). As per the mission plan, the spacecraft will remain docked to the space station to serve as an emergency escape vehicle during Expedition 31. The mission successfully launched to the International Space Station from the Baikonur Cosmodrome in Kazakhstan on Tuesday, May 15, 2012, at 3:01:23 UTC (9:01:23 local time) The Soyuz docked successfully with the ISS on May 17 at 4:36 UTC. The spacecraft carried to the ISS a three person crew (Gennady Padalka, Russia; Sergei Revin, Russia; Joseph Acaba, United States).